SARATOGA SPRINGS, N.Y.>> A new up-and-coming country star is set to play the SPAC stage this weekend as part of Florida Georgia Line’s summer Smooth Tour. 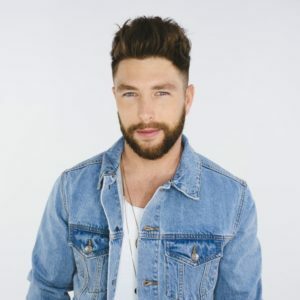 Breakthrough artist Chris Lane will open for headlining act Florida Georgia Line on Sunday night at Saratoga Performing Arts Center in Saratoga Springs. Lane is expected to bring a high-energy show and falsetto-infused R&B-meets-country jams to the local stage. The Weekender caught up with the country boy before the Spa City show to talk music, touring and plans for the future. • Q: How did you first get into country music? Lane: After finishing college, I put all of my spare time in to learning to play the guitar and sing. I got to a point where I wanted to try playing what I had learned in front of people, so I booked myself at a local bar and grille. I had all of my friends and family come out and packed the restaurant. Other places wanted that business so it just took off from there. • Q: Tell me about your most recent release and what inspired it. Lane: I was supposed to be in the writing room that day but ended up getting called in to the studio to do some vocals. Half way through the day, one of the writers called me and said, ‘Listen to what we have so far.’ I was so upset that I had missed out on the opportunity to be in the writing room that day. The song turned out to be ‘For Her’ and I couldn’t be happier with how it turned out. • Q: What are you looking forward to about this summer tour with Florida Georgia Line? Lane: I love being out on the road with those guys, I have learned so much from them over the years. I can’t wait for this summer and getting to watch them raise the bar every night. It definitely pushes me to bring my A game and get the crowd pumped up before they take the stage. • Q: Now that you have this big arena tour under your belt, who else would you love to share a stage with someday? Lane: I am very fortunate to have shared the stage with Tim McGraw, Faith Hill, Garth Brooks, and Backstreet Boys this year. I can’t wait to see where the future takes me. There are still a ton of artists I would love to play with, it’s hard to name just one. • Q: As newcomers on the country scene, what do you hope to bring to the table for the future of the genre? Lane: Country music has expanded so much and I am just happy to be a part of the genre. I hope with my music I can bring a high energy, fun sound that makes you want to get out of your seat and move.